Check out these awesome fingerless gloves!!! My friend, Rebecca Zicarelli, has a real love (obsession perhaps?) for knitting things diagonally. 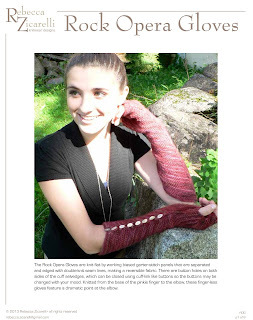 The Rock Opera Gloves pattern is the first completed and published design of her many diagonally-knit ideas. And, I was lucky enough to tech edit this pattern for her, help ease the pattern toward consistency and lay it out into a pretty pdf. Not only are Rebecca's Rock Opera Gloves knit on a bias, they have a great detail—which Rebecca calls "seam stitches". These stitches are a pair of stitches, one knit, and the other slipped on one row, then they switch being knit and slipped on the following row. When worked at the edge of the gloves, this technique creates a sort of I-Cord edging, and when worked in the center of the gloves, it creates a slipped-stitch welt that runs vertically. Throughout the pattern Rebecca uses some really ingenious ways of shaping—things I've never seen before—that work perfectly for what she wants to achieve. Some of my favorites are her I-Cord and Seam-stitch Bind-off techniques—really clever ways of maintaining the seam stitches along the edge while binding off stitches! While tech editing parts of this pattern, I had to pick up the needles to swatch to be sure I was understanding it correctly. Just those little bits of swatching really made me want to get the right size yarn and needles, and cast on a pair of gloves for myself! Favorite this pattern on Ravelry. I began knitting both of my gloves at the same time. This way, I'm sure they'll be exactly the same, and I'll definitely complete 2 of them! I bought this yarn at Topsfield Fair in Massachusetts a few years ago. It's SO lusciously soft. So glad to finally have found the perfect project for it. Thank you, Kristen. While the design may be mine, there's no doubt -- this pattern is wonderful because of your hard work. It's such a wonderful design, and variety of techniques. I'm glad to have been available to work on it with you!